Neo Circuit is a new point and click strategy puzzle game from roughseagames. Your objective is conquer all nodes in the playing field by strategically connecting to them thus making them yours. Click and drag to your target node to initiate an attack, cut the connection when needed by dragging a line across. This game packs some 30 levels playable in two different difficulty levels - normal and hard. The concept is not the first of it's kind but it's no doubt still entertaining and still can hold its own. 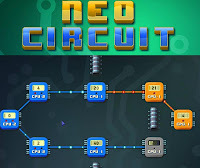 Meanwhile, here is Neo Circuit walkthrough guide showing solution to all of its levels.